CD-R 80 Min Silver IJ Printable 50 Pk 52xCombining a silver inkjet printable surface qualified for high-resolution photo quality disc printing with highly reliable CD-R recording performance, Verbatim Silver Inkjet Printable CD-R discs provide exceptional printing and recording performance on CD/DVD inkjet printers and duplicators. These uniquely coated discs are compatible for high-resolution printing on all major CD/DVD printers and provide a distinctive luminescent background resulting in rich, vibrant colour reproduction of photos, graphics or other images. 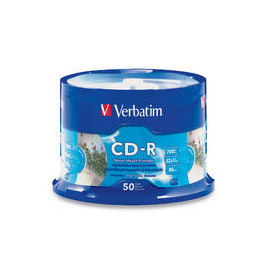 Optimised for both graphic and text printing, Verbatim Silver Inkjet Printable CD-R's incorporate the ideal surface for reliable ink absorption during the printing process resulting in fast ink drying and durable, longer lasting colours. Key Specifications: Photo quality printable silver surface 52x recording Bright, reflective silver surface Print pictures and text directly on the disc Compatible with direct CD/DVD inkjet printersPlease Note:Item V95005 is now priced as a pack of 50 and is no longer priced as individual units.